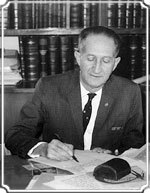 Our firm was founded by Antonio Guzmán in 1927, after graduating that same year from the University of Santo Domingo Law School. Mr. Guzmán soon became one of the most accomplished litigators in the Dominican Republic, although his practice was wide ranging, as was common at the time. In 1962, Mr. Guzmán was the lead counsel for the prosecution in the trial of the murderers of the Mirabal sisters, the national heroes killed for their opposition to the Trujillo dictatorship, the most celebrated legal case of the last century in the Dominican Republic. His private practice as an attorney encompassed more than eight decades, from 1927 until 2000. In the public arena, he was a member of the Constitutional Assembly which adopted a new Constitution in 1941, President of the City Council of San Francisco de Macorís (1961-1962) and member of the National Development Council (1968-1974). In 1977, he was presented for his achievements in the law with the “Order of Duarte, Sánchez y Mella, Gran Cruz Placa de Plata”, the highest award granted by the Dominican government to a private citizen. In 1983, Universidad Católica Nordestana received him as “Doctor Honoris Causa.”. A book about Mr. Guzmán’s life, Memorias de un abogado de pueblo (Memoirs of a Small Town Lawyer), was published in 2007.